A coating can consist of polymers, surfactants, dispersants, solvents/coalescents, defoamers, biocides and rheology modifiers. Each has a purpose to fulfill within the system to provide the right performance and application properties. Formulators use rheology modifiers (otherwise known as thickeners) to tailor viscosity and provide the right application profile through brush, roller, trowel, or spray. Formulators can add multiple rheology modifiers into a coating to achieve a variety of desired characteristics such as viscosity, pigment setting prevention, sag resistance leveling, and durability. Where Are Rheology Modifiers Used? Formulators use rheology modifiers to shape the product’s attributes in a few different ways. First, they may add rheology modifiers during grinding, a part of the production process where a thickener will decrease the particle size of pigment aggregates in the fluid medium using mechanical energy. Formulators may also add rheology modifiers to influence the letdown, which is a production phase where other input materials in the paint formulation are added to the pigment paste. Use of the modifier is determined by the application method. For instance, a brush or roller will require a more viscous paint/coating where a sprayer will need a much lower viscosity. While the final goal may be a painted substratel, the application’s rheology will have major effects on spilling, dripping, and splattering, and the final performance of the paint or coating. This means that a paint or coating achieves proper surface coverage without using too much or too little material. To understand the influence of rheology modifiers, you need to first understand the differences among liquid bases to which they are applied. Liquids are divided for rheology purposes with regard to their natural viscosity and its relationship to shear rate. Newtonian liquids are those where viscosity is constant and unchanged by shear conditions. Water, solvents, and oil are examples of Newtonian fluids that remain constant, regardless of low, mid, and high shear rates. Newtonian liquids respond to temperature with regard to changes in viscosity, not shear conditions. Non-Newtonian fluids exhibit a complex relationship between viscosity and shear. Specific among non-Newtonian liquids, pseudoplastics lose their viscosity as shear rate increases, seeing recovery when the rate decreases. Pseudoplastic fluids include paints and coatings, as well as foods like ketchup. These properties are important with respect to storage. Overtime, non-newtonian fluids will increase viscosity to reduce settling and increase stability of the overall product. However, when mixed, they need the viscosity to be reduced to better the flow rates and ease of application. A good example would be ketchup kept in a glass bottle. The longer it sits, the harder it seems to get and seems impossible to remove from the bottle, but with a little shaking, the entire bottle loosens up, thins out and more readily pours from the bottle. Rheology is measured in three ways: Brookfield viscometer, Kreb Unit viscometer (KU viscometer), and Cone and Plate viscometer, each representing a different shear rate. Brookfield viscometers measure fluid flow in low-shear conditions, such as a paint in the can or after its been applied to a surface. KU viscometers are associated with mid-shear fluid flow, such as paint viscosity as it’s being loaded onto a brush or roller or as the brush or roller leaves the applied surface. Finally, Cone and Plate viscometer are associated with high-shear flow. Good high-shear viscosity, referred to as ICI builders, is indicative of shear conditions as a paint or coating is being rolled or brushed on a particular surface. These viscosities are typically related to the Non-Newtonian fluids, with the understanding that we want and need our viscosities to change depending on what point in the application we are in. Each viscosity represents a different step in the process. In summary: Brookfield viscometers tell us our viscosity on a fresh can of paint coming out of storage that has just been mixed. They are a little thicker and need stirring. The Brookfield will tell us if our starting point paint is too high in viscosity to mix in correctly. The KU viscometer is loading the paint onto our applicator. We need the viscosity to drop from storage to mixing for proper loading to happen. KU tells us that the rheology is thick enough to maintain contact with our tool to prevent dripping, but not so thick that it doesn't coat our tool (think roller soaking in paints). Lastly Cone and plate viscometers shows us our final application to the surface. We now need our viscosity at a very thin level to be continuous from the adding to the brush or roller before applying to the substrates. So, our viscosity will “remain the same” from large quantities soaking into a roller to thin quantities going on to our wall or substrate. Several factors are important to consider when selecting rheology modifiers: compatibility, sag resistance, primary application, how the modifier should be added, and final production time needed. Formulators need to ensure that a selected thickener will be compatible with the dispersants and colorants in the formulation, while still achieving the desired viscosity. Like most additives, an incompatible rheology modifier comes with a chance of causing defects. The defects can be seen at several stages of the paint from the grind and let down all the way to the final films. First, look for agglomerations of the modifier during the addition. This usually means that there is pigment saturation and nowhere for the modifier to go. You may also see fisheyes and wet out problems in the final films. Also, consider the flow/leveling and sag resistance balance the application requires. Sag resistance refers to the tendency of a paint or coating to droop or “sag” on a vertical or slanted surface. For example, you may need good flow or no brush marks but also need good sag resistances if applying to a horizontal substrate. The selected rheology modifier(s) should prevent dripping and splattering by brush or roller and also perform properly as a thickening agent. By providing rheology, this allows for film building of the coating. Method of incorporation and final production times go hand-in-hand when it comes to the effects of the modifiers. Many rheology modifiers take extra time when adding them into large batches because they come in a powder form. When added too quickly, clumping can occur that can lead to film defects mentioned earlier. It is important to add them slowly in the beginning during high shear to avoid clumping, but adding slowly has a large effect on production time where time is everything. That is why it’s so important to use an efficient and compatible modifier for your system. Always consider your final application method. The application method will determine what factors are important to your paint or coating. If your final application needs to be sprayed on versus rolled on, the type and amount of rheology modifier will be completely different. At the end of the day, the final application answers three important questions about the modifier selection. What modifier? How much? And where should it be added. There are a several types of rheology modifiers based on their unique characteristics that drive formulations for different market needs. Tychem 68710, referenced above, is an example of a HASE thickener. HASE is a modified ASE with hydrophobic groups and operates as an associative thickener with anti-settling properties in water-based coatings, inks, and putties. Associative thickeners are hydrophobic and water soluble. HASE thickeners are typically alkali dependent for activation of thickening due to hydrophobicity. HEUR thickeners are nonionic polyurethane associative thickeners used in water-based coatings. When interacting with hydrophobic surfaces within a coating formulation, HEUR thickeners generate high viscosity. HEC is a versatile, water-soluble polysaccharide used for thickening flat to semi-gloss architectural latex paints. With a wide range of viscosity grades, HEC’s have excellent colorant compatibility and stores well. HEC’s have a better thickening efficiency, flow and leveling, film build, and sag resistance on vertical and slanted surfaces. Nonionic Synthetic Associative Thickeners (also known as NSATs) are often used in tandem with other rheology modifiers. For example, formulators may use low-shear effective NSATs with high molecular weight HEC thickeners in flat paints for the consumer market in order to achieve a spatter-free consistency. As a controlling mechanism, a rheology modifier is capable of improving the paint or coating formulation in a few ways. The modifier can not only thicken the mixture according to the method of application, but can also increase sag resistance; promote better storage and transportation of coatings by ensuring a consistent product where pigments are subject to sedimentation within the formulation; improve leveling properties and one-coat coverage; increasing durability; and make an easier-to-handle final product that is resistant to drips. While rheology modifiers are necessary for most paints and coatings, they do have their drawbacks. Using the wrong modifier can cause a variety of film defects, including fish eyes, wet-out problems on a substrate, and flocculation. They are also prone to clumping when added too quickly in a grind, which can cause issues with production times. Additionally, if a paint formulated with the wrong rheology modifier is used and it’s over-sheared, the paint will not recover in viscosity as needed and will affect the final application to the substrate. The biggest issue is that many rheology modifiers can be hard on water resistance. Because thickeners use their hydrophobicity to keep things suspended, they more readily accept water, which can be detrimental to a coating. 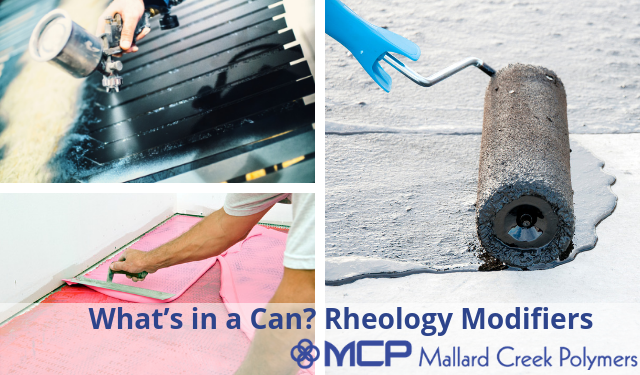 For more information on rheology modifiers available at Mallard Creek Polymers, contact our service team today.